At first glance this small bird appears very similar to the other flycatchers found on the Central Coast: it is a dull yellowish-greenish-brownish colour, has a light eye ring, and has dark wing and tail feathers marked by light-coloured wing bars. It also has the distinctive large flycatcher head topped by a small crest of tufted feathers. The Pacific-slope flyctacher can be distinguished from similar flycatchers by a few key characteristics. Its eye ring is bold, but broken above and expanded behind the eye. The top of its beak is dark but the bottom is entirely bright orange. Its back is distinctly brownish-green while its underparts are yellowish, and its breast is tinged with brown. Click here for useful illustrations. 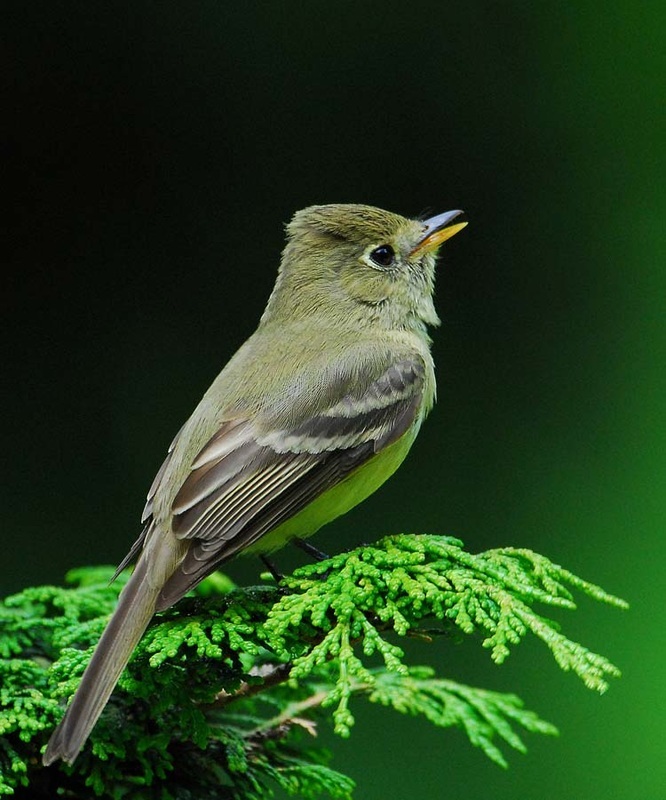 The Pacific-slope flycatcher song and call is especially useful in identification: visual characteristics can be tricky to see. Both its song and call are high-pitched, mouse-like squeaks and seet calls. Click here to listen to these sounds. Pacific slope flyctachers are found in moist, shaded areas like coniferous forests and around shaded streams. In the summer they breed in southern and central BC as well as coastal areas from southern Alaska to northern Mexico. They winter in lowland areas of western Mexico. Hammond's and willow flyctachers are also found on the Central Coast. The lower beak of the Hammond's flycatcher is only partially orange, its eye ring is expanded behind the eye to form a teardrop shape, and its colouring tends to be more grey-green. Its song and call are lower-pitched. The willow flycatcher has a less prominent eye ring and a noticeably white throat. Its song and call are lower-pitched, 'buzzier' sounds. 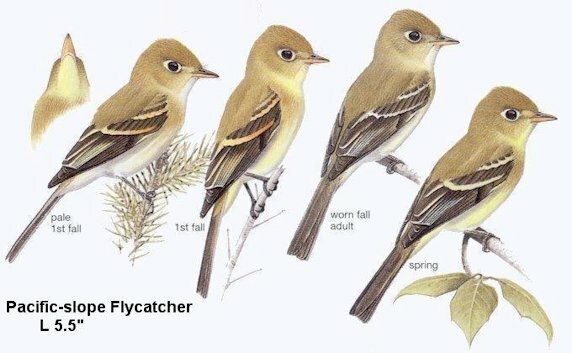 The Pacific-slope flycatcher and the Cordilleran flycatcher were once considered one species, then known as the Western flycatcher. The Pacific-slope's species name may indicate the difficulties encountered when distinguishing between the two species. The area of range overlap is small, however, and nowhere near BC's Central Coast. Dunn, J. L. and Alderfer, J. (Eds.). (1999). National Geographic Field Guide to the Birds of North America. (3rd Ed.). Washington, D.C.: National Geographic Society. Pp. 292-293. Pacific-slope Flycatcher. The Birds of North America Online (A. Poole, Ed.). Ithaca: Cornell Lab of Ornithology; Retrieved from the Birds of North America Online. Accessed 11/11/2013.